I've been feeling a tad under the weather lately...allergies I think. I had to lay low for two days last week and it drove me nuts! I had to give up a kayaking adventure while the Pres fished as well as a day with my daughter!! I was not a happy camper. But on Thursday, a day I normally don't go to the gym, I was soooo glad that I was feeling myself again that I readied myself for the workout I missed. The workout was a good one, if you know what I mean. While there, some of the gals at the gym and I talked about going to a place that opened up at the UConn campus which is only about 10 miles away from us. We were going for a snack. 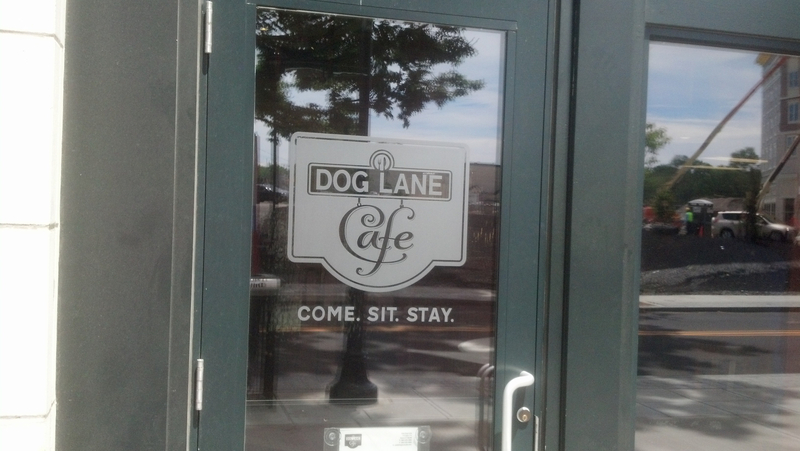 Located on UConn's campus on Rte 195 in Storrs (a village in the town of Mansfield), it is surrounded by all sorts of restaurants and eateries, like Dog Lane Cafe. 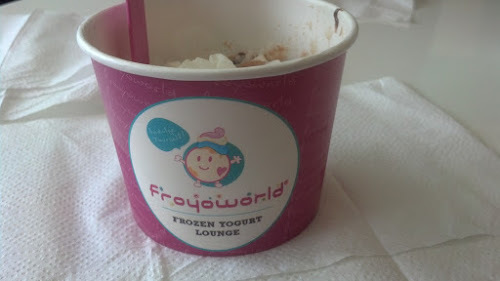 Unsure of what to expect, I followed the other three women into Froyo World, the frozen yogurt lounge. Just the word lounge is appealing, don't you think? You begin simply...with a cup about 4 inches deep and 5 inches wide. Then the thought process has to kick in. 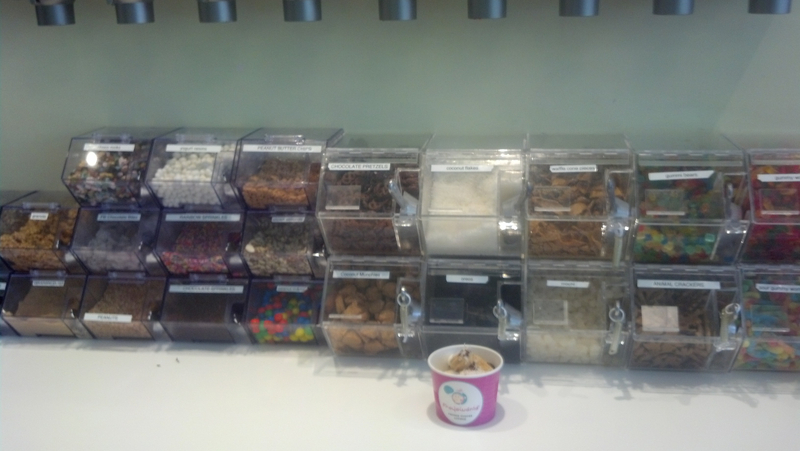 You try to decide what kind of frozen yogurt (or yogurts) you want to place in your cup. I selected vanilla and peanut butter cup. Then once you make it past the remainder of the yogurt selections (which change regularly), you meander over to a counter that has rows and rows of goodies to place on top of the delicious frozen stuff! Goodies shoveled on with I'll describe as mini grain scoops...goodies such as mini peanut butter cups, coconut, graham cracker crumbs, yogurt covered chips, chocolate sprinkles, etc, etc. If you make it past the gummy bears, gummy worms, chocolate covered pretzels, etc, etc, you move to the next counter where yet another selection is before you. In front of you now are brownie chunks, cookie pieces, fruit of all shapes and sizes, etc, etc. When you're done designing your creation, it is weighed and paid for before finding a table to sit and savor this mouth watering treat that should definitely NOT become a post workout habit. But, it should satisfy me for a few days! Although I enjoyed the company of the gals, my creation was THE BEST and I now have a Froyo card to use for future purchases! Oh, one more thing. 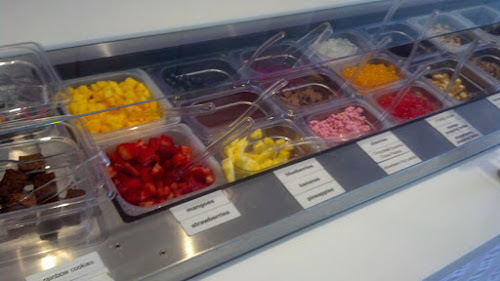 I forgot to tell you before you get to the register, there's assorted toppings like strawberry, hot fudge, whipped creme, etc., etc. P.S. I went to the gym Friday and will going Monday, etc., etc. This puts a whole new twist on frozen yogurt. Sounds like you were constructing a masterpiece. Do you-all have any trouble with stray Huskies still running wild in the area after Greek Week?